embassy.org Business Directories: Vernon Heating & Air Conditioning, Inc.
Vernon Heating & Air Conditioning, Inc.
Vernon Heating and Air Conditioning Inc. is a HVAC company in Virginia founded in 1974. We have a dedicated commercial division to handle projects that residential companies don't see. Customers include the Embassies of Peru and Mozambique as well as over 300 7/11 convenience stores. 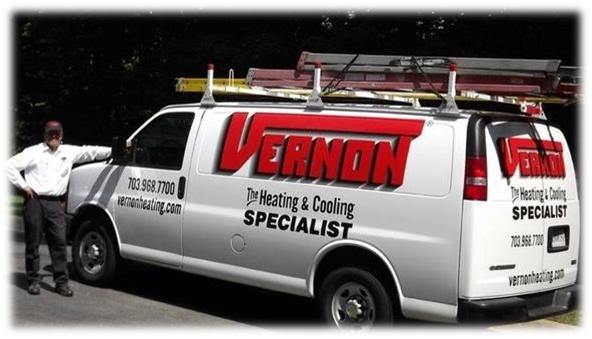 Vernon provides commercial as well as residential installs, seasonal maintenances and 24/7 service calls to preventive maintenance contracts. Our commercial division operates separately from the residential division, so we have techs and installers who work on commercial systems every day. We have contracts with Embassies, dozens of churches, restaurants, government complexes, country clubs, and doctors offices among others. We moved into our own beautiful complex in 2014. This allowed us to have our own sheet metal operation as well as professional offices and meeting rooms. We also have an indoor area that allows for vehicles to be cleaned during the winter months so we keep a professional appearance. All employees are background checked and all technicians are clean and professional looking with uniforms that have names embroidered on shirts and jackets. Ryan Jackson is the Vice President of Vernon Heating and Air Conditioning, Inc. and he manages the commercial division. Our commercial division staff includes a dispatcher, customer service rep, billing coordinator and sales assistant. These four employees work on commercial accounts only and assist the Commercial Account Executives in keeping our rating high. We serve DC and Northern Virginia as well as Montgomery County in Maryland. We provide installs for new systems as well as seasonal maintenance callls, service calls and 24/7 service for our preventive maintenance customers. Other commercial solutions include refrigeration systems, server rooms, cooling towers and exhaust fans.